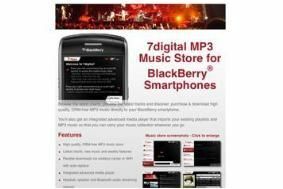 7Digital launches MP3 download store for Blackberry | What Hi-Fi? While the likes of iTunes, Napster and even Amazon and Play, grab the headlines when it comes to selling downloads, 7Digital has been quietly plying an excellent trade minus the fanfare. If you're a Blackberry owner, that could be about to change. 7Digital has announced an App for the 'BB' that allows you to buy MP3s from its catalogue of over seven million files. The application will allow users to wirelessly browse for tunes and then purchase DRM-free, 320kbps MP3s from major labels and independents alike. Tracks will be delivered over the cellular network at a lower bitrate when a Wi-Fi connection isn't found, upgrading these tracks to 320kbps, full quality tracks when you're next connected to Wi-Fi. The 7Digital application supports the Blackberry Bold, the Curve 8900, the Curve 8520, and the Storm. Head to the 7Digital website or to the Blackberry App World for more information.